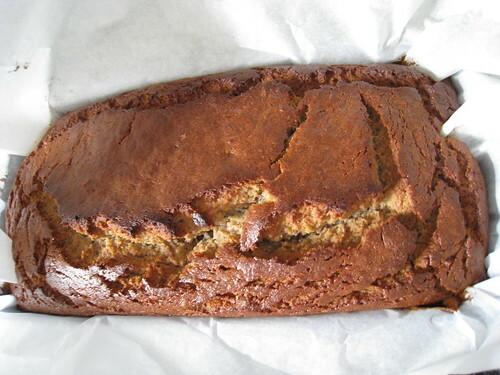 I made the most amazing banana bread today, born of this recipe from Gluten Free Girl. Mine had a basic flour blend (using the proportions she lists on that very recipe). I threw in a little almond flour for good measure and used about 5 of the frozen bananas (thawed) that I have had hanging out in my freezer for who knows how long and I used both brown sugar and white sugar. I literally dumped (well, scaled) everything into a bowl and hit it with my mixer before pouring it into a loaf pan. (One of the great things about gluten-free cooking is that you don’t have to worry about over mixing!) Then I popped it into a 350° oven until the internal temperature of the bread was about 210° (you can use the toothpick method though). In the future, I might use a little more flour to compensate for the extra liquid from the bananas, but really? It wouldn’t need much.